Having got off to a very slow start (possibly because of confusion over what time the doors were to open), Back To Our Past 2014 came alive by lunchtime to the sound of clicking computer keyboards and the questions of the curious, and the inevitable queues were soon forming on some stands. It's always great to see the genealogy and related heritage sectors coming together under the glass roof of the Industries Hall, and, while the marketplace is slightly smaller than in previous years in terms of the number of exhibitors, visitors would hardly notice. There are plenty of people, groups, organisations willing and able to help answer their genealogy/dna queries, look up records, offer special discounts, help them explore product ranges or discover more about their family history and, especially through the extensive lecture programmes, generally guide researchers to develop higher skills and knowledge. The lectures – two daily strands of genealogy/heritage topics and one daily strand of genetic/dna presentations, were, as always, very well attended. One thing that is noticeable at this year's Back To Our Past, just as at WDYTYA?Live in London in February, was the lack of BIG record releases to coincide with the show. We have, perhaps, been a bit spoiled over the last few years into believing that a never ending stream of important collections are stored up in a pipe awaiting an appropriate date for release. If that was ever the case, those days have certainly gone. Which doesn't mean there's nothing new to report, thank goodness! I met up with Ancestry's Rhona Murray, Content Acquisitionist, and Mike Mulligan, Product Manager, who told me that the British Service Medal and Awards Rolls (WO329) would be released by the company shortly before Armistice Day (11 November). This collection of 6.5million records includes the soldier's battalion number, which is information missing from the Medal Rolls and allows researchers to seek the appropriate War Diary; the diaries, where they survive, may provide a much clearer idea of an ancestor's war experience and movements, even though he is unlikely to be named. Needless to say, this collection includes a huge number of Irish soldiers. System development has also been ..er... developing. A new feature, Filmstrip, should ensure researchers recognise there is more than one page to a record. It's a kind of 'Please turn the page' notification, except in visual format, clearly indicating there are more pages to explore in the record. This sounds rather neat. I don't mind admitting that I have sometimes missed such extra pages; military service records and Irish census documents are examples where I have not always spotted on a first visit to a collection that additional information was available. Those who have uploaded their family trees to Ancestry will be pleased to hear that the 'hinting' software has been improved to provide better, more pertinent results, and the placename variant recognition in the main search operation has become more intelligent. If, for example, you type in Queenstown or Kingstown, you should automatically receive relevant results that include Cobh or Dun Laoghaire respectively. In other words, the software knows that Queenstown is Cobh and Kingstown is Dun Laoghaire. Ancestry is also expecting FindAGrave to grow dramatically over the next year. The company was brought into the Ancestry fold at the end of 2013; while its free records appear in Ancestry searches, it continues to maintain its own distinct identity and web presence. I was surprised to learn that some 200,000 of FindAGrave's records are of headstones in Ireland. That's a substantial collection, even if it's small fry compared with its 110million records of North American graves. Anyway, what's important to its growth is a new Upload and Transcribe tool. Just introduced in Beta, this feature allows researchers to upload multiple images of headstones from a particular cemetery and choose to either transcribe the inscriptions themselves or have the FindAGrave community transcribe them. Mike Mulligan showed me some of the 1,400 photos he recently uploaded for Clar St Agatha's RC churchyard in Donegal, which, as if by magic, have already been transcribed by this community. 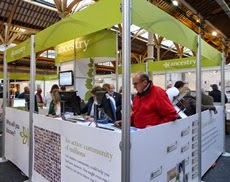 Back To Our Past visitors to the Ancestry stand should take note that there's a 20% discount on the UK Premium and Worldwide subscriptions available (have to sign up by Monday). 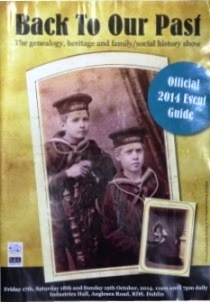 The Irish Family History Society, meanwhile, has uploaded its 1985-1994 journals to the members area of its website, ifhs.ie. Mary Beglan, newly elected as IFHS Chairman, told me she was delighted that these journals, many of which are now out of print, are available in digitised form for the benefit of members. They were digitised by Eneclann in memory of the late John Heueston, past IFHS Chairman and Treasurer. An index is being created and a second tranche of journals will be added in February 2015. GRONI, the General Register of Northern Ireland, are making their first trip to Back To Our Past and are keen to spread the word about their online civil registration site. Visitors can try out the site for free at their stand. Alistair Butler told me that the site, which went online at the end of March, already has more than 11,000 registered users. He said user feedback had been extremely positive, with most researchers very pleased with the options available and the pricing arrangements. Importantly, too, the site is meeting its running costs and demand has pretty much matched the levels forecast. 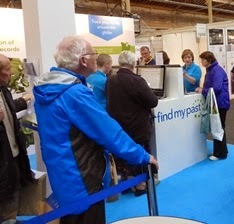 FindMyPast – as always, a busy stand with a near permanent but moving queue – was promoting the recent additions to its database of nine newspaper titles. I've covered these over the last few weeks in this blog (newspapers added to the British Newspaper Archive website are automatically uploaded to the FindMyPast British and Irish news collection), but I'll run through the titles for good measure: The Drogheda Journal/Meath & Louth Advertiser, Dublin Monitor, The Galway Vindicator & Connaught Advertiser, Limerick Reporter & Tipperary Vindicator, The Newry Examiner and Louth Reporter, Northern Whig, Pue’s Occurrences, Sligo Champion and The Waterford Chronicle. I managed to collar Marketing Executive Niall Cullen towards the end of the day. He told me that the Clare Electoral Roll records (not the Electrical Records as I wrote them in my notebook!) will be next out of the pipe in the not too distant future. There's also another Irish release of interest coming along in the New Year, but that's hush hush for now. However, researchers will soon begin to see some movement of records resulting from this year's merger of Irish Origins and FindMyPast.ie. First up will be the Griffiths Valuation maps, one of the prize jewels of Irish Origins, which will become available, searchable by name, on FindMyPast.ie within the next few weeks. The Family Tree DNA stand was another lively stand, with a steady stream of people signing up for DNA tests. I was pleased to meet Debbie Kennett for the first time, even though she managed to get €70 out of me for a Family Finder test! One of my brothers took the Y-DNA test a couple of years ago, but I've never really got to grips with the findings and 'new matches' coming my way as a result. Now I've done this new test, I really must invest some time to understanding the data that's generated. Over on the North of Ireland Family History Society's stand, there was an interesting blue rinse on display (step up, Maggie), a collection of the society's recently updated research booklets for sale and news of another two publications containing graveyard inscriptions from two local churches – Newmills Presbyterian and St. John's Lylo, both in Portadown. These inscriptions were originally recorded in 2005 by members of what was then the Portadown Family History Society (now North Armagh) but have been recently updated. I also called in on the Dublin South Libraries Local Studies team. I'd urge any researcher with links in the area to do the same, either during the show or via their website southdublinlibraries.ie. It has a new historical mapping system dating from 1760 right up to 2009, a steadily growing collection of documents, photographs, books and journals, and ephemera, and oral history files relating to the Revolutionary Period. Over a busy afternoon, I had lots of fun catching up with people I already knew as well as people with whom I may well have been in contact before but had never actually met. The chance to meet face to face is one of the great things about getting everyone together under one roof. For me, it's one of the most enjoyable features of an industry get-together. I also picked up a lot of other snippets, brochures and tips worth following up, and I'll bring news of these over the course of the next week. In the meantime, I'm going to treat myself to a day of lectures tomorrow. What a sublime indulgence that will be! Back To Our Past is open again on Saturday and Sunday, 11am to 7pm. Details and lecture programmes.